It is only in the last ten years or so that Thin Lizzy and Phil Lynott’s contribution to music has really been acknowledged in my opinion. It’s easy to forget that by the time of the documentary on this DVD ‘Renegade: The Philip Lynott Story’ that the band were about to call it day inside of 18 months as the band felt washed up. That said Phil’s charm shines through in his interviews and there are some nice videos of his solo and Thin Lizzy songs including ’Kings Call’ featuring Mark Knopfler. The clips that feature Snowy White clearly reveal how uninterested he looked in the band despite his impressive musical contributions and it’s a shame that the later John Sykes line up never had more of a chance to put their stamp on the Thin Lizzy legacy. Still ’The Sun Goes Down Documentary’ filmed during the final tour is an interesting insight into the background of how to put a show together and features ’Are You Ready’ and a truly atmospheric ’The Sun Goes Down’. There is a very young and enthusiastic Darren Wharton at the beginning of his career and a very worn out looking Phil Lynott dealing with the demise of his band. The main selling point in this release is the Dublin show filmed during the ‘Fighting’ era of the band, passed around in bootleg form for too long this show is now remastered and restored. The sound occasionally does not always capture the lead guitar as strong as it could but considering the age of this film it is still damn impressive. Phil’s vocals are clear especially on opening number ’Fighting My Way Back’ and the bands twin guitar attack looks great on ’Wild One’.At this stage the band had not really perfected their stage craft, both Scott Gorham and Brian Robertson are more subdued and even Phil lacks his full on bass guitar aimed like a gun stage pose. 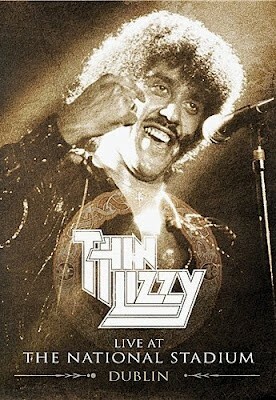 The shape of things to come, when the band play ’Suicide’ and ’Rosalie’ is clear to see and its all smiles on the Thin Lizzy stage. Final song is the classic ’Still In Love With You’ with close ups of Phil singing this song with a real sense of emotion before the programme end credits bring it all to a premature close. Finally as a bonus a few TV performances and a rare promo video of Phil Lynott’s ’Old Town’ make for interesting viewing. If there is a negative in this review then it is only the extent we are reminded of how much we miss Phil Lynott.